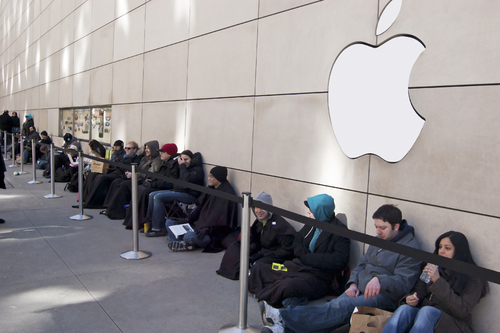 Apple Sold Over 45 Million iPhones – And It’s Not Enough? It’s not easy being Apple, the most profitable company on the planet. Case in point: The company’s 2016 4Q earnings, announced this week. By all accounts, things look pretty rosy. Apple posted quarterly revenue of $46.9 billion and quarterly net income of $9 billion. Services Revenue grew 24% to an “all-time quarterly record” of $6.3 billion. Well, not everyone is thrilled even though Apple said it sold 45.51 million iPhones in the three months ended Sept. 24. As Reuters points out, this is actually the third successive quarter of declining iPhone sales. And now there are “broader concerns” Apple has lost its tech-savvy mojo, even with its newfangled iPhone 7 (that doesn’t burst into flames up when you charge it, btw). Now, I’m no financial analyst and I don’t even play one on TV. Yet I can’t seem to wrap my head around the fact that a company sold over 45 million units in a few months and it’s still not good enough. Yes, iPhone cultists will always upgrade to the latest and greatest so there aren’t any concerns there. But clearly, the mobile phone space has become commoditized and investors are wondering where Apple’s future growth will come from. All of the Tesla rumors are certainly fun to follow and if any of them come true, could yield some very interesting results and potentially create new revenue streams for Apple. But instead of following rumors, I’ll place my bets on real partnerships. Like the one announced earlier this year between SAP and Apple. There’s no doubt the enterprise space is ripe for Apple’s picking, and when it comes to revolutionizing the way people work, I can’t think of a better combination than Apple and SAP. Thanks Angela. Hope we have more news to share about this incredible partnership soon! We do, Former Member. And it’s right here! Good point, Former Member. It doesn’t matter how good a publicly traded company does if its revenue falls short of Wall Street’s expectations. But Apple will be fine. As you noted, the new partnership with SAP will help the company excel in the enterprise space! maybe, it would be easier for Apple it it were more innovative rather than try to seek more rent (with their peripheral devices), but maybe not. this interview from about 10 years ago offers some suggestions: good content but not so good quality (caution: it’s very long). all the best on the SAP partnership journey with Apple. Thanks for sharing Greg, appreciate it!